A three-bedroom house, old style early 1970s, with only one bathroom. Suitable for a small family. One bedroom has a 9 square metre deck. Nice. There's a garage also. And there's a backyard of 360 square metres for play and so on. Only outside dogs and inside cats allowed. Available 8 or 15 December. 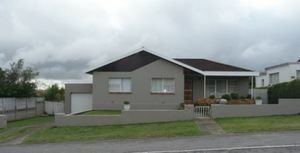 Call 082 494 9055 for a viewing appointment on Saturday, 3 November, late afternoon.